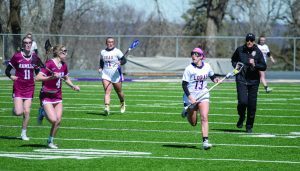 The Loras College women’s lacrosse team was all over this past week, just falling short both at home and on the road. Last Wednesday, March 20, the team took on Wartburg College here in the Rock Bowl but fell short 13-18. The team also took on the Monmouth Scots on Saturday, March 23, and Hamline on Monday, March 25. 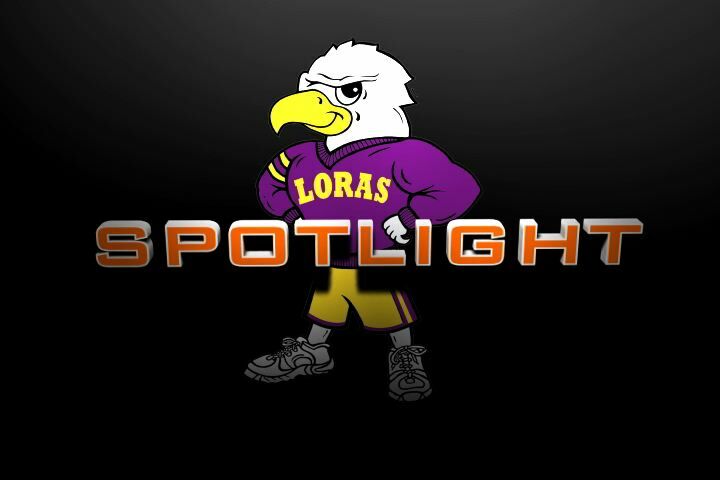 The Wartburg Knights were able to be slightly more efficient than the Loras College Duhawks with the total shots taken between each team within three, Wartburg 35, and Loras 32. However, Loras was able to force a few more turnovers than they gave. Junior Mid-fielder Olivia Flynn tallied six goals on 10 shots and also added a team-best of five ground balls. Junior mid-fielder Olivia Flynn (right) works her way down the field after scooping a ground ball. Flynn and her teammates had to play the entirety of the game because Loras had just 12 players. On March 23, the team took on Monmouth College who started out strong with a goal less than two minutes in. It didn’t take long for freshman mid-fielder Clare Brunn to get her own goal less than two minutes later. The Scots went on a small run of three goals until sophomore Katlynne Wolf found the net. 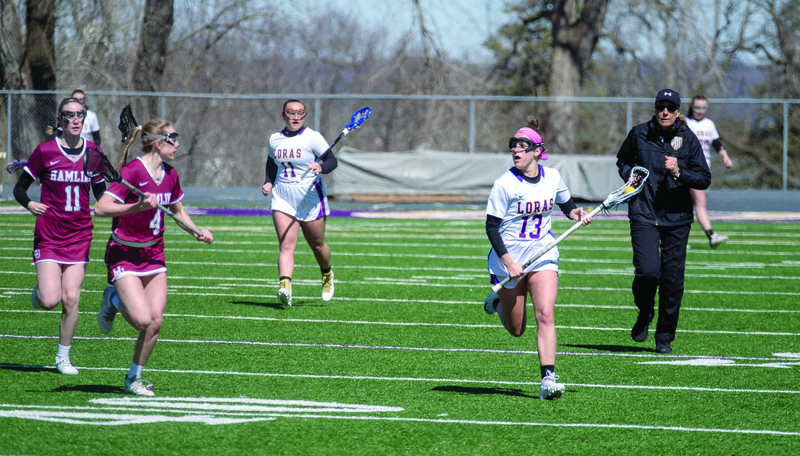 Loras was able to battle back and cut the deficit to one at a 6-5 with 10 minutes left in the first half. Both teams continued to battle, however Monmouth was able to execute a few more goals extending their lead to 11-7 at the end of the first half. During the match, Wolf set a new career-high with four assists while Brunn continues to thrive in the collegiate game, running her season goal total to 15. The undefeated Hamline Pipers were a force to be reckoned with as the Duhawks came out strong, leveling the score within two minutes of game play. Hamline found a momentum wave that earned them three goals until Veljacic converts on the free position shot. Flynn was then able to score a third goal, cutting the Hamline Pipers lead to one. It seemed that the game could shift at any moment. It finally did in favor of the Pipers who went on a seven-goal run to close the first half 11-3. The Duhawks tried to gather some momentum with a goal from freshman attacker Jacqueline Condon with 10 minutes left in the second half. The Pipers ultimate took control and finished the game 19-4. The team’s next game is this Saturday, March 30, at the University of Northwestern in Saint Paul, Minnesota at 4 p.m. Be sure to check duhawks.com for live updates of the game.